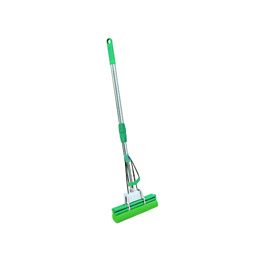 Sponge Mop with Stainless Steel Handle comes with a 13" PVA Sponge Mop with Stainless Steel Telescopic Ergonomic Handle that is easy on your back! 100% PVA does not promote bacteria is static free. Sponge packed moist, ready to work when you are. Chemically resistant to acids, bases organic solutions Attracts lint, pet hair and other particulates like a magnet - holds until rinsed out. Lifts and Absorbs 12 times it"s dry weight. Holds 14 oz. of liquid without dripping. Applies solution evenly on floors, and without dripping on walls, or ceilings. Adjustable stainless steel handle minimizes arm and back exertion. Extraordinary 60" overall reach when handle is fully extended. Sponge mop head refills available on this website.